In order to invite a connect customer, navigate to the Client tab. From here select List and choose the client you wish to invite the customer for. Once you have selected the client, their name will appear on the left main menu. In this menu navigate to the Linked Customers tab. This will open another drop down menu with the List tab. Select List to bring up the linked customer page. Located at the bottom right of the page is the Invite Client option. Select this to send an invite to the client. Default Area: The area most used by the client for their services. Team Leader.Coordinator who is taking care of this area will get notifications when customer will request/update shift. Read Only: Only allows the customer to view the client's services only. They cannot make any changes in the roster. Once the above information has been entered, select the Invite option. This will send the connect customer a Notification email containing an invitation link. This invitation must be accepted within 48 hours. After this time the invitation will become invalid and admin will need to send another invite. To find out more on re-sending invites read Resend Connect Customer Invite. When the customer receives the email and opens the link it will direct them to a password creation page. Here they must enter the password they will use to log into their ShiftCare Connect Account. The customer's log in details will then be the email in which they received their invitation and the password they created. Lists what action can be or needs to be taken. If the customer has not accepted their invite a resend invite action will be listed. If the customer has accepted their invite and activated their account, an Un-link action will be listed. A time frame will be listed of when the customer last accessed their account. In correlation to the Action section, an Unlink action will be listed. If there is no information listed then the customer has not accepted their invitation and thus not activated their connect account. 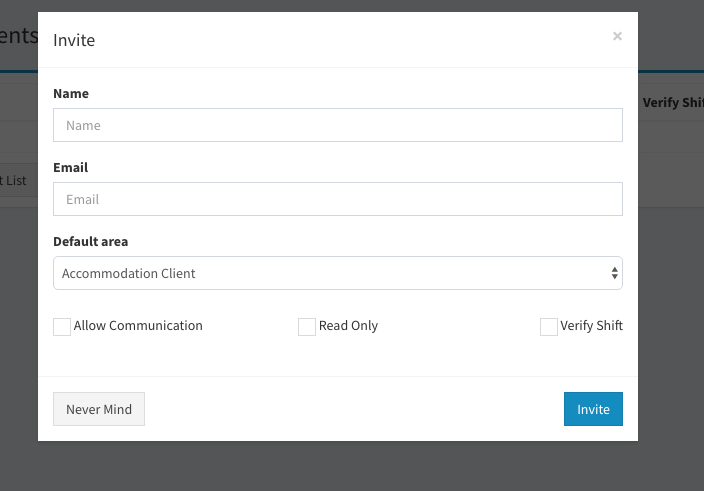 In correlation to the Action section, the Resend invite action will be listed. Once a customer has been invited and provided access to their account, they will be added to the Connect Customer list. You can navigate to this list via Client --> Connect Customers.